Bathroom scales ain't what they used to be. They're now called things like 'body composition monitors', because they've evolved. Scales now not only measure body weight, but also your body fat. That's done using well-proven science around the extent to which different bodies resist electricity when a small, painless voltage is run through them. That's why you always have to stand on these things barefoot: they're running electricity through you (don't worry, you won't feel a thing). Whether you’re starting a new diet or exercise regime, or are already in good shape and want to monitor and/or crow about that fact, bathroom scales are a useful ally. But what is the best bathroom scale? What is the best smart bathroom scale? At T3, we did a test a few years back to assess the accuracy of a range of bathroom scales, using a Loughborough University lab test (water displacement) to find out a T3 staffer's exact weight. On comparing it to the scales, we found that most were inaccurate to varying degrees with the exception of Tanita's scales. Exact accuracy, as with fitness wearables, is not not necessarily essential, however. If you're tracking your weight and body fat percentage long-term, if the statistics are going in the right direction, and within safe limits it doesn't really matter if your scales are a few grammes out. None of the scales below are dangerously inaccurate. That said, the best scale in terms of reliability and usefulness is probably the Tanita RD-901, which strikes an excellent balance between looks, accuracy and range of body metrics measured. If you just want to track your weight and body fat percentage alongside your favourite fitness tracking wearables, you might be better off with the much simpler scales from Fitbit, Garmin or Nokia. Firstly, you don't have to put them in the bathroom, though that is the standard location for scales in the UK. 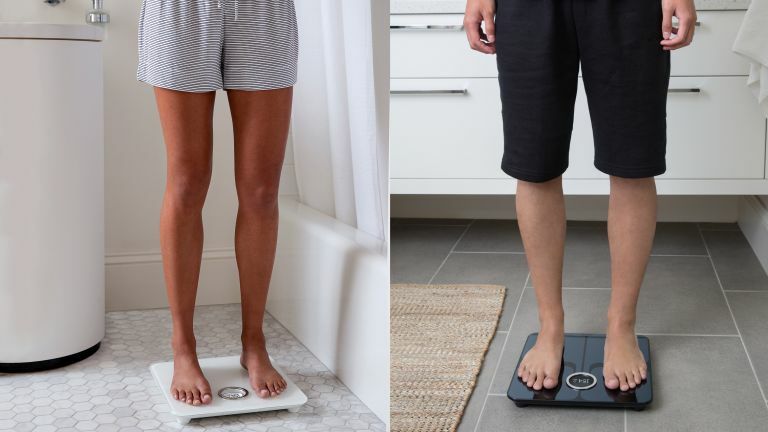 Secondly, what we're talking about here are body monitor scales or smart scales – you can still get plenty of bathroom scales that only tell you your weight, but that is not necessarily a useful metric on its own. Smart scales range from accessories that you add to your fitness wearable's data feed – from the likes of Fitbit, Nokia and Garmin – to something more like laboratory equipment, which is able to track things such as visceral fat and BMR. As with most areas of tech, these scales are largely styled so as to fit seamlessly with your lifestyle and home decor, rather than looking like something you'd find in your GP's surgery – though there are exceptions to this. Once you input your gender, height and age, scales can estimate muscle mass, bone mass and body water percentage. It can then add easy stuff like your BMI – a weight-to-height ratio that is fairly useful for calculating obesity, although it can be skewed if you have a lot of muscle, as rugby players never tire of telling us. It can also give insight into your Basal Metabolic Rate (BMR – the number of calories you burn daily just by existing) and visceral fat rating (the more dangerous fats that surround the stomach and vital organs). Although this data is usually shown onscreen, these scales also work with apps via Wi-Fi or Bluetooth connections, so you can track your progress over time on your phone and/or laptop. It's worth bearing in mind that many of the statistics pulled up by scales are informed estimates rather than gospel truths. Your basal metabolic rate (BMR) can be easily estimated from your weight, height, gender and age, but a more accurate calculation would also take into consideration your daily and weekly activity level, which most scales don't. Not everyone even agrees that BMR or BMI are useful – for athletes and those who exercise hard every day, arguably they are not. However for the majority of the population, they are. So don't live your life based on what your scales tell you. But do take their advice on board when working on a diet, fitness regime or general medical programme. Tanita puts out three types of scale, and they're all in this list. At the top end, they do expensive devices perhaps more suited to the deep pockets and thirst for knowledge of a research institution. At the bottom, very good body monitor scales that look absolutely horrible. Right in the middle sits this beauty, which will tell you everything from weight to visceral fat level to a slightly terrifying 'cardio age' estimate – try to stay the right side of that. All the data is sent via Bluetooth to Tanita's own app which is, to put it mildly, not amazing. However, it does now feed into Apple Health and Google Health of you want to track your body's fluctuations over time. The 4x AA batteries it takes seem to last forever, too. Fitbit's Aria 2 is like a more attractive, better connected, but much simpler version of the Tanita RD-901. It only tells you your weight, BMI and body fat percentage – which is all a lot of people want. The minor genius of it is that it then reports this to your Fitbit account, so you can monitor your weight trends and use it alongside your Fitbit wearable's daily calorie-burn estimates. Obviously, if you don't use a Fitbit, don't bother. Add MyFitnessPal or Fitbit's own dietary features and you can then sync your meal-plans, daily calories consumed and weight goals, if you want. Fitbit's app is a decent motivator and will let you monitor your calories in vs calories out in an exactingly precise manner. Whether that's a healthy route to fitness and weight loss is up to you. On top of the body composition data, the Nokia Body Cardio scale also claims to calculate your cardiovascular health through a Pulse Wave Velocity (PWV) reading. As well as measuring your heart rate – Nokia suggests doing it at the same time each day, preferably first thing in the morning, before you've had your morning coffee – the Body Cardio calculates your 'arterial health' via PWV. This measures the velocity at which your heart pulses blood into your arteries and so is related to (but not the same as) blood pressure, and a faster PWV can be a symptom of a less healthy heart. A similar method is used in several other products, but they're more geared around telling you if you are ready to workout hard on any given day, or take it easy. The Nokia markets it more as a warning sign that you should see a doctor or revise your personal habits. The scales look great and use a handy arrow display to ensure you are standing correctly balanced on them when being weighed. Weight, body fat percentage, BMI and PWV can all be tracked over time with the Nokia Health Mate mobile app via Wi-Fi or Bluetooth – it's like a more French version of Fitbit. The price does seem a bit on the high side for what you get, however. The Omron BF511 is similar to the Tanita 901 at #1, but adds handles that you bend over and grasp whilst weighing yourself. This supposedly gives a more accurate reading of your body fat than is possible from just shooting a current through your feet, but is a tad undignified. The Omron calculates BMI, BMR and visceral fat levels. There's no app, but for the money it's a solid choice if you can put up with its rather NHS clinic looks. Triathletes are among the most keen datamongers in the endurance universe, so it's is no surprise that Tanita – one of the best brands for smart scales – partnered up with Ironman for this model. The BC 1500 uses 8 electrodes to calculate your body composition, with no fewer than four retractable handles and four sensors on the scale platform increasing the precision of the reading and making it more accurate. As a result you get both full-body composition (fat/water/muscle), but also results for specific body segments (trunk, right arm, left arm, right leg and left leg). The software for your laptop or mobile is more like a bit of academic software than a user-friendly app, but most triathletes would probably have it no other way. If you're just someone who wants to measure your weight, the BC 1500 is total overkill. As the market leader in more serious sport tracking devices, Garmin naturally produces a smart scale that is quite similar to Fitbits… but a touch more serious. On top of measuring weight, BMI and body fat the Index adds muscle mass percentage, then syncs (with something less than 100% reliability, it must be said), with Garmin Connect. As such it can feed into all your other Garmin-tracked activities, appearing on your Connect dashboard and helping with calorie burn estimates and so on. For a cost-effective solution to weighing yourself, look no further than the John Lewis Anti Slip Bathroom Analyser Scale which, as you would imagine, does precisely what it says on the tin. You get weight, body fat and BMI measurements on screen, there's no app or other 'smartness' and it costs 25 quid with a 15-year warranty. There's nothing to get excited over and nothing much to complain about either. There's nothing smart about these scales apart from the appearance. Still, for a quick, easy-to-read and accurate reading, the Salter 145 Scales are hard to beat. If you want classic, analogue bathroom scales with zero insights provided beyond your weight, look no further.